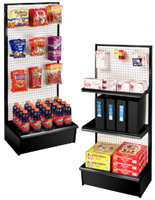 Looking for heavy duty pegboard gondola displays? These durable freestanding aisle fixtures and accessories are manufactured with steel construction to accommodate a wide range of stores and merchandise. 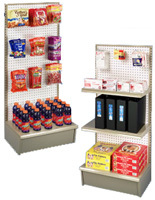 One of the reasons metal pegboard gondola displays are so popular is due to their longevity. Built to last for years to come, these commercial and retail store display racks provide dependable service with virtually unlimited adjustability and customizable features. 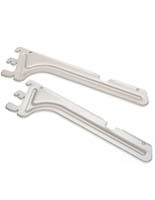 These metal gondola shelves can be purchased in single or double-sided models. 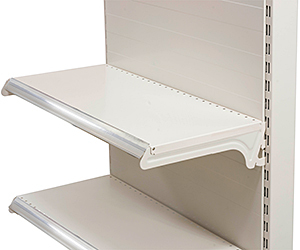 The single-sided shelving units are designed for placement against walls, while the two-sided fixtures are perfect for creating store aisles or standalone displays out on the sales floor. The lowest shelf is part of the base which raises off the floor to allow plenty of clearance for customer accessibility as well as aisle cleaning and/or mopping. 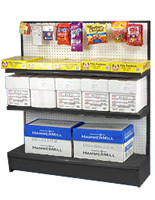 All metal pegboard gondola displays can display any number of steel shelves, only limited by the height of merchandise. 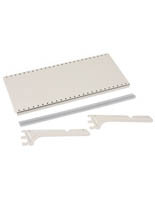 On the front of the shelves are clear plastic tag holders for inserting product pricing. 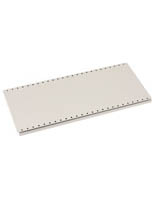 In addition to perforated panels for use with sturdy peg-hooks, plain back panels are available for standard shelved merchandising. Peghooks are ideal for use in conjunction with standard cantilever shelving to customize these fixtures for maximum visibility and accessibility. One of the best features this retail display shelving provides is their modular design. 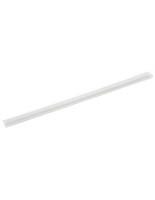 Inside a small independent gift shop or store, one or two fixtures may be entirely sufficient. On the other hand, large supermarkets, box stores, and convenience stations simply line these fixtures up side by side and back-to-back to create fully customizable shopping aisles. 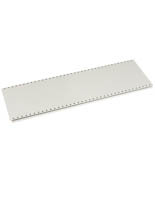 Thanks to their rugged construction and ease of use, our metal peg-board racks, shelves, and accessories are available with competitive pricing and fast shipping, making them a great choice for commercial environments of any size.